There is just so much to do when you are traveling on an airplane with a baby. Chances are, you may never have done this before and are worried sick that you just might forget that all important item for your precious baby. Well, there is no need to worry or be concerned. We have produced a ‘traveling with a baby checklist’ for your convenience. This comes in two downloadable versions – pdf format for you to print and then add your own details and tick off as you go or an excel version you can download and adjust yourself and use. 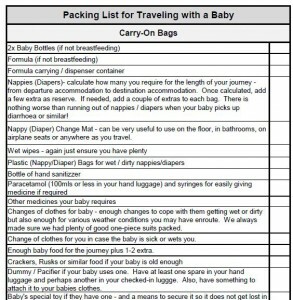 These checklists contain a complete list of the main items you should consider packing when traveling with your baby. The list has been complied from our more than 100 flights we have taken with a child under 18 months old – some flights as short as 50 minutes and some as long as 14 1/2 hours – part of 4 -5 day treks from East Africa to Australia or New Zealand. Essentials aspects are covered in these checklists such as such as formula, food, nappies (diapers), clothing, medication and toys through to major items such as portable cots / cribs, portable high chairs and car seats. For more in-depth information on packing and how to get this done without forgetting important items or becoming crazy in the process, visit our page on what to pack. Here you will receive all the advice you will need to help you in preparation for your flying with your baby. Being well prepared is one of the most important aspects of maximising your chances of an enjoyable flying experience with your baby. Enjoy the information and the checklist. Please also feel free to leave any comments or questions below and I will be sure to respond. Thanks for taking the time to read the post and make use of the checklists. Thanks for taking the time to review this post and hope you find it useful when it becomes time to travel. Your site looks very good. I never knew that there was so much information that could be shared on traveling with a baby. The printable checklist is a nice touch. I like that the post is short and to the point and yet provides a wealth of knowledge. You obviously travel a lot and I would find it interesting to hear a few stories of the unexpected happening and how you prepare for those instances now. Thanks for the comment and taking the time to review the site. Yes – we have done a lot – I think I should do a map at some point of the places we travelled with our babies / toddlers! I actually have a few stories on the site. I want to build more as I have a lot – you can read them here. You’ll probably laugh or cringe at some of these lol! Thanks again and chat again soon. Having been a parent travelling with 2 kids, this checklist makes sense. I also have a habit of keeping almost all the needed items on the baby luggage and baby strollers itself, this way, just need to remember the strollers and everything else will be in place. Hi and thanks for reading the article and commenting. Its all about having a system that works for you. Of course, depending on the length and type of travel it can also have an impact. I certainly appreciate your point however and if everything is in one place (or two), then it makes it so much easier to just pick up those items and go. My oldest is now 9 and yes has done a lot of traveling – had her own Emirates Silver Frequent Flyer status for a number of years. My youngest had done 23 flights by 17 months old. Hope you have enjoyed the experiences traveling with your 2 children and may you have many more. It of course becomes different and a bit easier as they grow up. Where is the best place you’ve traveled with your children? Thanks again and all the best? I love is checklist and guidance on flying with young ones. My kids are 8 and 10 now so it is easier but in their younger years, as a single parent I dreaded flying and avoided it if at all possible. Being on the plan was nerve racking but worse was trying to keep an eye on both of them in busy airports…and then if I had to go to the bathroom….oh no. I found it very stressful and your insight can help make the experience less overwhelming. Wow – I can relate to your experience and feelings. Airports can be particularly stressful – deadlines, officials etc. I once had a very hard time when I was travelling with 3 of our young ones 5,3 & 1 years old to a small city in Australia – 5 days from our place then in Tanzania to the place in Victoria, Australia! We were delayed in Perth Airport for 13 hours and the place was just chaos with cancellations across the board. I had to wait in an area to try and secure seats on a flight and my boy went to the toilet and never returned. Eventually I had all the Emirates crew looking for him and they found him happily watching other smaller airline planes taking off and landing – very stressful indeed. Thanks for sharing and yes its pleasant as they get older – mine are now 3 – 9 years old – a different ball-game. Great checklist! Here’s something to add: One thing that I did when traveling with my infant son (with my husband) is to bring a regular sized pillow (for your bed!). You can use this to lay across your laps and let the baby sleep! This is SO much easier because you can leverage your space and let them sleep with a little more cushioning for both of you. When I didn’t do this, I experienced strained muscles from holding a sleeping baby in one position without being able to move–major soreness factor! Happy traveling! I have a 3 month old, haven’t flown with him yet, and me and my wife have discussed this very thing. I like how you didn’t write out a bunch of stuff but instead included a checklist to download. That would make it so much easier to prepare. I would like to hear how it is to actually fly with your baby. What do you do for popping ears? and overall fussiness? Thanks for taking the time to read the article and download the checklist. I hope it is useful. Preparation and a positive attitude are the keys to successfully flying with babies and toddlers. You can check out a lot of information on various practical aspects of flying here http://flyingwithkidz.com/on-the-plane. There are also many other articles on airports, stopovers etc.